The book titled above has been very well received and all 1000 of the 1,000 copies printed have been sold. The hard-cover book of some 400 pages includes 4 pages of colour plates, a dozen maps, more than 50 family trees and nearly a hundred black and white illustrations. 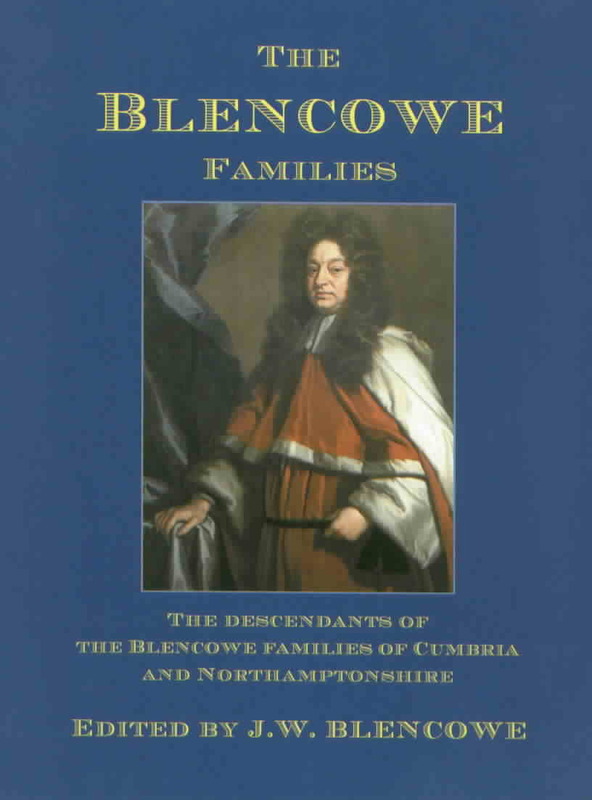 Blencowe Families book is a superb production and fine family heirloom THE BLENCOWE FAMILIES: The Descendants of the Blencowe Families of Cumbria and Northamptonshire, edited By J.W. Blencowe. 433 pages, hard cover and stitched pages. Limited edition of 1,000 copies. First published in 2001 and distributed by: The Blencowe Families Association, 24 Dale Close, Oxford OX1 1TU. IT is always a great pleasure to review a book like this one, which is of such a high standard. It is even more enjoyable when it comes from one of our own Guild members! The copy I have for review is No. 106 of 1,000 copies printed, so I assume that all the copies are numbered — a very nice touch that makes each book individual and extra special. The cover is in a rich royal blue with golden yellow lettering. Gracing the front dust jacket cover is an eye-catching coloured plate of the painting of the most distinguished family member, Sir John Blencowe, dressed in his Judge's robes, by Dutch artist John Closterman. The presentation of the book is of an extremely high standard. The text is clear and easy to read and there are numerous charts, maps, black-and-white photographs and four coloured plates to highlight the text. At the end of each chapter a plain, lined page has been left for the readers to include their own notes — another excellent idea. The contents pages at the front of the book are informative and the names of the contributors are shown next to their articles. The 21 authors are given their own brief biographies over the next three pages. I feel this gives the book a very personal feeling. What a splendid idea! Not only will future generations find their family history explained in glorious detail, but they will also be treated to a wonderful description of the family members who wrote the articles and made the book possible. The book is divided into 20 chapters. At the end of each chapter a list of references is supplied. The first deals with the earliest Blencowes, starting with an entry in the Pipe Rolls of 1231, which mentions rent paid for two acres of land in the vill de Blenco at Greystoke, Cumberland. Chapter three covers heraldry, while chapter four is dedicated to the Blencowes of Marston St. Lawrence in Northamptonshire. it opens with the death in 1988 of Lawrie Blencowe. This event caused the closure of 540 years of Blencowe family history at Marston, which had started before 1446 with the arrival of John de Blencow from Cumberland. The Receipt Book of Ann Blencowe, written in 1694 — Ann was born in 1656, the daughter of Dr. John WaIlis, a distinguished scholar — is the subject of the fifth chapter. In 1675 Ann married John Blencowe of Marston St. Lawrence, who became an MP, then a judge and was finally knighted in 1697. Today this book would be known as a recipe book and the information within its pages gives a wonderful account of 17th century household management. Some of the recipes could probably still be useful today — though I am not sure about the one for Horse Dung Water, which was given to women in labour! The interesting lives of the members of the illustrious BIencowes of Chailey, Sussex, take over chapter six and chapter seven is devoted to the history of the Prescott Blencowes of Thoby Priory, Essex, where up to 40 years ago you could still have seen a desirable 19th century country house before it became obliterated and where today there is only a scrap metal yard. I feel this is a first-rate example of why we have a duty to preserve our family history for future generations. 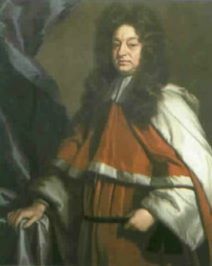 Chapter eight shows how other minor Blencowe branches could have originated from the unrecorded offspring of Christopher, the younger son of Thomas Blencowe of Marston St. Lawrence. These minor families could also have descended from other younger sons of Thomas's father and grandfather. The wonderful history of the Blencowes of Blencow Hall in Cumberland is discussed in chapter nine. The journey starts on April 20 1353 in a letter of an attorney giving an order for a possession of land by freehold to William, son of Adam Blencowe, and pauses on the death of Anthony Blencowe in 1578/9. Chapter 10 is devoted to Anthony Blencowe (1574-1618), Provost of Qriel College Oxford, and Arthur Blyncowe who was a suspected Catholic. We resume our journey of the history of the Blencowes of Blencow with Sir Henry Blencow (1562-1634) in chapter 11 and close with William Blencowe (1714-1769). How the younger sons survived and sought a living is covered in chapter 12. John Blencowe, a yeoman gardener of Whilton. is the earliest member of the Blincows of Whilton and Long Buckby who are traced in chapter 13, and in chapter 14 the Blencoe, Bunco, Blincko, Blinckoe and Blincoe family histories are covered. The next chapter covers the earliest emigrants and opens with Adam de Blencowe at the siege of Calais in 1363, goes on to Robert Blinco's arrival in Barbados, the appearance of James Blincoe in Maryland 1671 and the next four generations, and then covers the fifth generation of pioneer Blincoes who left Virginia to settle out west, and finally closes back with James Blincoe, the first member to be recorded in the Americas, and the search for his English roots. Some of the later emigrants are covered in chapter 16 which includes the family of Clinch Blinco who was sentenced to transportation in 1772 at Leiston, Suffolk, for stealing a pig. The Blencowes of the southern hemisphere have their own chapter in 17. This opens with Thomas Blencowe, who was transported in April 1835 for seven years to Australia, and goes on to cover the family history of other BIencowes who went to Australia, Tasmania and New Zealand. Then on to John Blencowe, a missionary in the Solomon Islands, and concluding with a Blencowe adventure during World War I in the South Atlantic. Chapter 18 deals with some later emigrations of Blencowes to North America, including an in-depth account of the assisted emigration of paupers from Bicester in the 1830s. The Blincos of Ontario are also traced from Weedon Bec, Aynho and Mixbury. The 19th century saw the emigration of a number of Blencowes to America from Gawcott, Buckinghamshire, and their stories are followed. Other emigrant's stories are also told. Chapter 19 is devoted to the 19th century in England and the fortune of the Blencowes during this period. Chapter 20 concludes the Blencowes' history with the editor's own family history. To aid the reader there follows nine appendixes. The first covers the use of computer software for the recording and processing of data. The second shows a list of documents that have been transcribed, a set of which has been deposited at the Northamptonshire County Records Office. The reader is then aided with two separate lists, one showing the maiden names and the other the married names of the Blencowe wives. Also included is the individual's RIN number, the place, type of record, century and the document number the person is referred to in. Following this, there is a summary in date order of the early documents that were used to find the Blencowe evidence and individuals' RIN numbers are again included in brackets against their name. In appendix three we are given details of the Guilds and Livery Companies of the City of London records that have been researched. These comprehensive records are found at the Guildhall Library. In doing this, the authors have made sure that the same records need not be searched twice. Appendix four is a lengthy ode, ‘An Address to the British Before they leave their Homes’. Appendix five is a list of emigrants from Bicester to New York in 1830. The Northern Expedition of John Blencowe (1720-1777) is the subject of appendix six and in appendix seven we are given the wonderful ‘tale of the missing heir’. The Hodgson Papers, which are documents that were owned by Lawrence Blencowe who died in 1988, are covered in appendix eight and the story they hold is fascinating to read. The last appendix, nine, is ‘The DNA Story’ and how these studies are opening up new avenues for family history research. Finally, at the back of the book there is an extremely detailed index covering 10 pages. This has then been divided into three sections, up and to the end of the 16th century, the 17th and 18th centuries, and finally the 19th century up to the present. The Blencowe name spellings have been grouped together and then arranged alphabetically. This has been done to try and make it easy for the reader to locate the individual they might be looking for amongst the many persons who carry the same or similar name. This book is a stunning example, of a well explored, superbly written family history What a gem for future generations of Blencowe family members to own: a fantastic family heirloom to leave behind.